We are sure all of you are vigilantly watching the most recent and unprecedented wave of political violence in Ethiopia, and the deep wound inflicted thereof amongst fellow citizens. While the country continues to experience one of its worst population displacements triggered by political malice and ethnic violence, many innocent Tigreans are still trying to come to terms with what the future hold for them. For these Tegaru, what is at stake is not politics. It is their future! 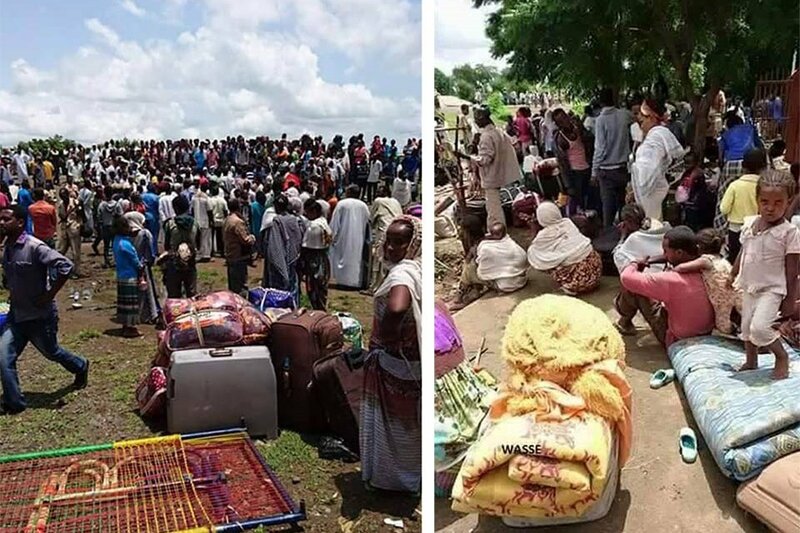 Semi-official reports estimate that more than 60,000 Tegaru have been evicted by violent ethnic reprisals, mainly from the Amhara and Oromia states. Many have already lost their loved ones, homes and businesses. They have suffered injuries, and experienced unspeakable violence and brutality. The trauma and suffering of these families is unimaginable. Keeping up with rent, utility costs, food, clothing for multiple children, medical expenses, educational expenses, household supplies, and a myriad of other needs simply outpaces all available efforts and resources. The Tigray state government has been an excellent primary short-term support resource, but the task of resettling theses families extends far beyond what the regional government can provide. They need our help to heal, find safety, and rebuild their lives. We know that many of us are looking for a way to help theses families. So, let’s join together and show them the great compassion that Tigreans are endowed with. Your donation provides a sense of hope to our fellow Tegaru! Any amount makes a difference to this families. Thank you for helping. For the past few months, a group of young Tigrayans professionals have been working hard to mobilize Diaspora Tigrayans across the world to fundraise funds to support internally displaced Tigrayans. We truly appreciate everyone's support and dedication as we continue to properly provide relief to the most vulnerable groups of the displaced persons. We would like you to know that the project requires patience and sacrifices and we urge friends and supporters to continue to be patient with us as we work hard to implement this project and provide relief to displaced Tegaru. We clearly understand the urgency of the work on hand, and therefore we are working around the clock to ensure the project gets implemented properly. We have tried to update you using the few media platform we have at our disposal. We urge you to visit agiaforum.com and listen to our recent interview. When you are doing public work, it's not lost upon us the importance of trust and confidence. We take this work seriously, and we go the extra mile to ensure accountability and transparency. Despite some of the unfounded allegations that are being made on Facebook, your donated money is in good hands, and it will go directly to provide relief to displaced Tegaru. We also value the trust placed upon us by you, and we will continue to honor the promise we made to you. Therefore, we would like to remind you that from the start of the project, we had promised our donors that we would ensure the money raised would be delivered directly to the displaced people. That always has been our strategy. We will continue to honor that promise as we implement the project. •	Assembled a team of responsible and trusted people in Mekelle that would help with logistics and implementation. •	Currently working with Tigray Regional Government Bureau of Labor and Social Affairs (BOLSA) to obtain legally registered and most vulnerable displaced Tegaru that can be supported by this project. We take any allegations seriously. While it is unfortunate and disappointing that people are bent on character assassinations, rest assure that we practice collective leadership, and we emphasize transparency. For instance, any major decision that affects the progress of the project is made democratically, including the removal of individuals from the project committee for violation of the code of conduct that the group finds unacceptable and hinders the progress of the project. We call on the public and former members of the project to refrain from making unfounded allegations. While disagreements are healthy, misstating facts and making innuendos only serve to delay project implementation. Such inappropriate personal behavior goes against the interest of the internally displaced Tegaru who need our financial and moral support at this crucial moment. We hope this press release has answered any questions you may have regarding the progress of the project. We believe in open communication and highly encourage everyone to approach us with any questions regarding the Displaced Tegaru Relief Fund project. We can be reached via e-mail: dtrf.team@gmail.com or thru our Facebook page @Displaced Tegaru Relief Fund. Thank you for your constant support and patience. Tegaru Disaster Relief Fund, Inc. It is a two part video. With three million internally displaced people, Ethiopia is going through one of the most severe - and under-reported - humanitarian crises in the world. The topic of refugees and displaced people will head the agenda at the Africa Union summit in Addis Ababa next month. One of the biggest camps in Ethiopia is Qoloji, which is made up mostly of ethnic Somalis fleeing persecution. Qoloji contains 80,000 people. The International Organisation for Migration (IOM), financed by EU Humanitarian Aid, has built latrines and showers and is working on hygiene awareness. In total, there are 600 sites for internally displaced people in Ethiopia. IOM is continuing to track the number of displaced people, as well as their movements and living conditions. This data is the first step for assessing their needs and enabling more efficient aid distribution. Tegaru Disaster Relief Fund was established by a coalition of young Diaspora Tegaru professionals, working together to provide relief to the thousands of Tigraru that have been internally displaced throughout Ethiopia due to the ongoing ethnically motivated attacks against persons of Tigrayan roots. A complete list of team members and profile coordinating this fundraising effort can be found in the Team members section here on GoFundMe or on our Facebook Page @DTRF.TEAM. Tegaru Disaster Relief Fund is working with KERADION Elderly Association, a grassroots nonprofit organization based in Mekelle, Tigray region where the displaced people are located, to help us with the logistics of reaching out to the displaced Tegaru. Our aim is to profile 200+ individuals that are the most vulnerable of the displaced. To do that, Keradion and team have, in Mekelle have approached Bureau Social Affairs of Tigray to give us a list of the people that we will finalize and begin supporting them. Money collected via Gofundme will be deposited to our Bank of America bank account. As you can imagine, the problems the victims face daily are different in type and scale. Therefore, a careful assessment of how we may better help them needs to be conducted. Once we have studied the needs of the victims, we will immediately begin sending the fund through wire transfers by coordinating with Keradion. We will be working with Keradion and other concerned stake holders to document the impact your donations have made on the lives of the displaced people. We will make sure every penny spent is traced where it went and how. We will keep you posted on the progress we are making. Please visit our Facebook page mentioned above and you can send us any feedback or comment you have regarding this project. We have now reached $85,116 which is very close to the goal of $100,000. You guys have been so awesome, words can’t express fully how grateful and proud we are by your generous donations. Because of you, our donors, individuals that are victims of hate will be empowered and gain hope. We intend this fundraising campaign open as the issue of internal displacement has worsen from time to time. Lastly, we would like to thank GoFundMe for enabling us to organize these type of campaign to help the victims of ethnic violence in Ethiopia. We ask your support to make our dream a reality and would like to assure you that the money will go directly to the victims and we will provide an update once the funds are properly dispersed.